When we have an idea in mind we have to go for it ! This could be the main thread of Vincent Paolantonacci's approach. Last March, we evoked the project of electric wheelchair worn by insurer from Porto-Vecchio, Hugo's dad, a very sportive child but with reduced mobility. A step born from a daily life where, for a chair weighing 120 kilos, the least obstacle of eight centimeters becomes impassable. From this thought, in October 2015, the desire was born to create an innovative, more versatile wheelchair, able to evolve both indoors and outdoors and, at the same time, promote life in society. With the advice of a friend an engineer at Airbus, Vincent was quick to sketch this chair. Then Icam, the engineering school of Toulouse, gave him their support. From the sketch they went to the 3D model. Remained the thorny problem of the eternal "nerve of war". It remained to cross a new course. 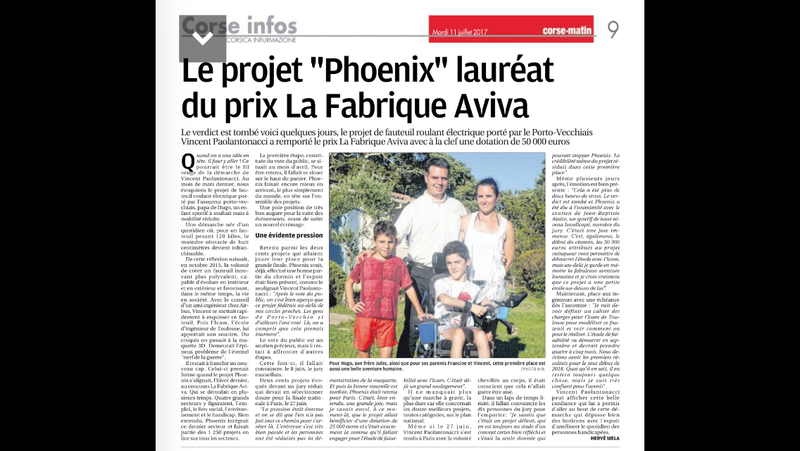 It took shape when the Phoenix project was aligned, last winter, the contest La Fabrique Aviva. Which took place in several times. Four main sectors were included: employment, the social bond, the environment and the handicap. Of course, Phoenix integrated the latter sector and was part of the 1,250 projects competing in all sectors. The first step, consisting of the public vote, was in April. To be retained, it had to be on the top of the basket. Phoenix did even better when it arrived, in the simplest way, in the lead on all projects. A pole position very auspicious for the next events, before undergoing a new skimming. The public vote is a valuable support, but there were other steps to be taken. This time, it was necessary to convince on June 8 the Marseilles jury. Two hundred projects evoked before a reduced jury that was to select twelve for the national final in Paris, June 27. « The pressure was enormous and we told ourselves that we did not go all the way to stop there. The interview went very well and the people were seduced by the demonstration of the model. And then the good news arrived. Phoenix was retained for Paris. It was, of course, a great joy, but I also knew, at that time, that the project would receive an endowment of 25,000 euros and that was exactly the amount that had to be committed for the study of feasibility with Icam. It was already a great relief ». There was only one more step to climb, the hardest because it involved the twelve best projects, all categories, at the national level. Even if on June 27, Vincent Paolantonacci went to Paris with un andefectable will, he was aware that it was not going to be easy. In a limited time, it was necessary to convince the ten jury members to win the prize. « I knew it was a delicate project that is still at a concept stage (although carefully considered) and that was the only piece of information that could stop Phoenix. The credibility of the project is reflected by this first place ». Even several days later, the emotion is still present: « It was more than two hours of stress. The verdict fell and Phoenix was unanimously elected with the support of Jean-Baptiste Alaize, a disabled high-level athlete, a member of the jury. It was an immense joy. It is also the beginning of the road, the 50 000 euros awarded to the project will allow to start the study with Icam, but beyond that I will keep in memory the fabulous human adventure and I believe really that this project has a little star above it ». Now, engineers have a deadline in autumn: «I will have to define specifications for the Icam of Toulouse to model this chair and see how it can be done. The feasibility study will start in September and should take four to five months. We expect to have the first results for the very beginning of 2018. Anyway, there will always be something left, but I am very confident for the future». Vincent Paolantonacci can display this great confidence which allowed him to go to the end of this approach that goes beyond many horizons with the hope of improving the lives of people with disabilities.